A 7-foot tall goat-headed Baphomet deserves a place on state grounds? Will Satan be celebrated on the lawn of the Oklahoma State Capitol? A devilish group based in New York believes it should be perfectly OK. The group, which calls itself "The Satanic Temple," today unveiled its proposal for a monument it intends to erect next to another religious statue: a depiction of the Ten Commandments. It would also include quotes from poets William Blake and Lord Byron. 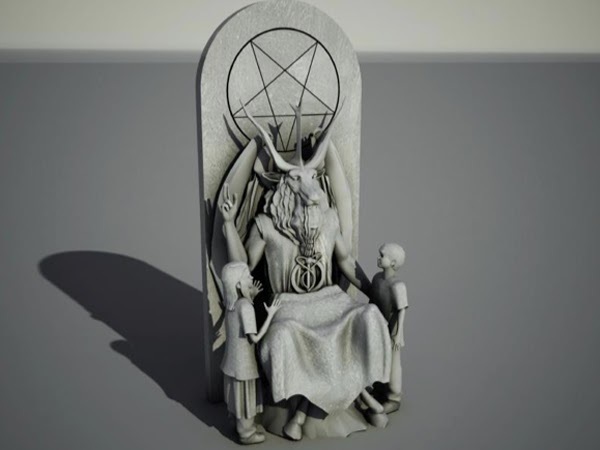 The monument, said the group’s spokesman, was designed to reflect the views of Satanists in Oklahoma City and could doubly serve as a tourist attraction. Oklahoma state legislators in 2009 approved the installation of a privately-funded Ten Commandments monument. It was installed last year over the protests of the local chapter of the American Civil Liberties Union. The Satanic Temple wasn’t the only group to apply for a monument; People for the Ethical Treatment of Animals, the satirical Church of the Flying Spaghetti Monster and a Hindu group have also requested a place near the Capitol steps. "Either way you cut it, this is a First Amendment issue," Greaves said. "Once they open that door, they can't discriminate." State Rep. Mike Ritze, who spearheaded the campaign to erect the Ten Commandments and paid for that monument, did not immediately reply to a request for comment. Oklahoma lawmakers have declared that Satanists should not be allowed to construct a monument of their own. The city Preservation Commission last month voted to ban additional statues on Capitol grounds until a judge decides on an ACLU suit to remove the current Ten Commandments monument. Asked why the Temple had chosen to descend on Oklahoma, Greaves said the locals had reached out to him after the Ten Commandments had been erected. But he admits, "We were looking for this." "We needed locals who were members in a town, people who were willing to sign affidavits and use their address on the documentation," Greaves said. "People to say they're members of the Temple and living in that town. Otherwise it would be encroachment by New Yorkers on the people of Oklahoma." He said the Temple had a surprising number of backers in the state. "When people talk about the values of Oklahoma, they'd be mortified to see the number of emails from Oklahoma supporting this." “Medieval witch-hunts taught us to adopt presumption of innocence, secular law, and a more substantive burden of proof,” he said. The Satanic Temple last year made national news on several occassions. The group held a rally for conservative Florida Gov. Rick Scott praising Scott for opening the door to all religions after signing a law allowing school students to deliver "inspirational messages" at public events. The group also unsuccessfully tried to place a Satanic holiday display at the statehouse in Tallahasee. Although Florida allowed a creche, a Festivus pole and a pasta draped chair celebrating the Church of the Flying Spaghetti Monster, the state drew the line at Satan. "You could see the disappointment on the faces of the Pastafarians," Greaves said. "They had hoped to be banned, too. "I guess we present more of a threat to the narrative of Judeo-Christian primacy."